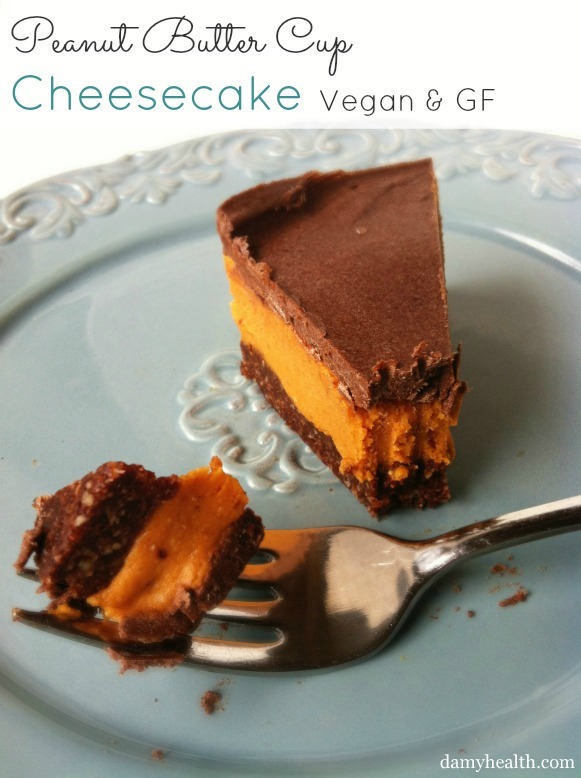 Vegan Peanut Butter Cup "Cheesecake"
I have one last entertaining dessert for this week! This one is Oh-So-Good! 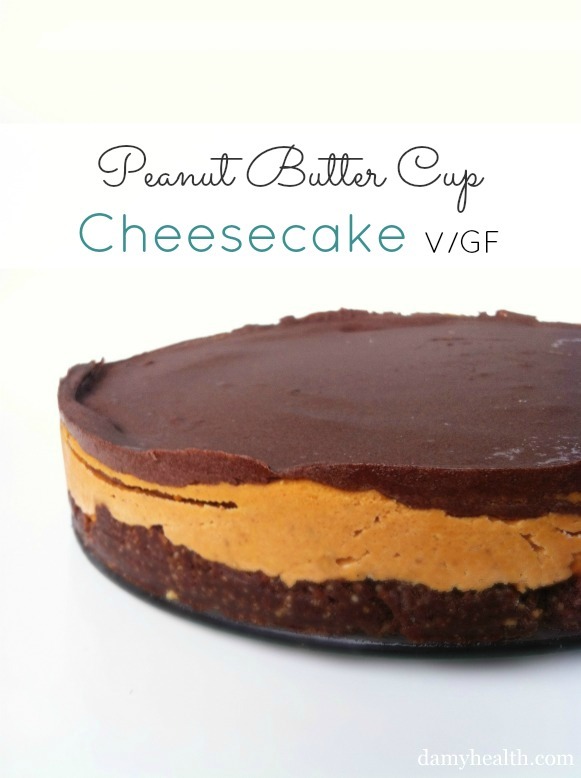 This is my Vegan Peanut Butter Cup Cheesecake. 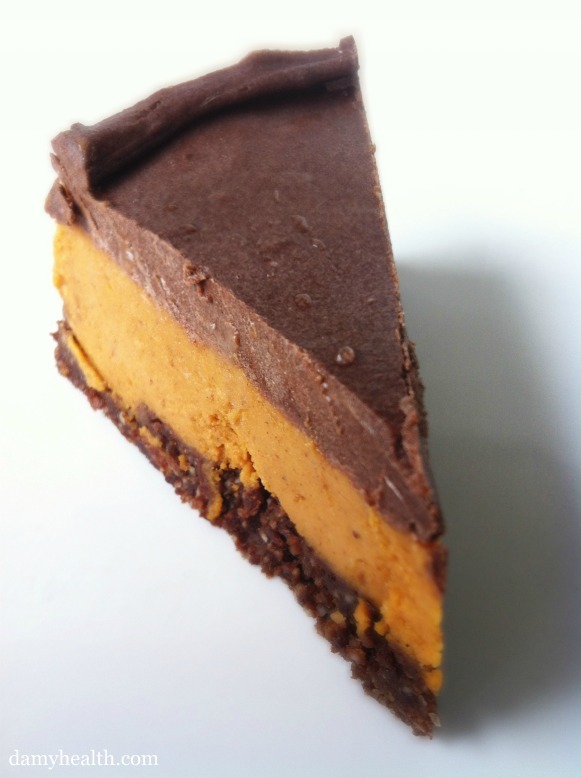 I call it a cheesecake because of its texture and decadence. It contains no cream cheese. 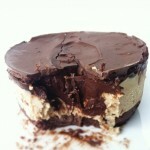 This dessert looks like a huge peanut butter cup and tastes dreamy! It is velvety and smooth. It is a pretty dessert to serve and will be adored by your guests. I love that this recipe is easy to throw together, contains powerhouse coconut oil and extra fiber from the pumpkin puree. 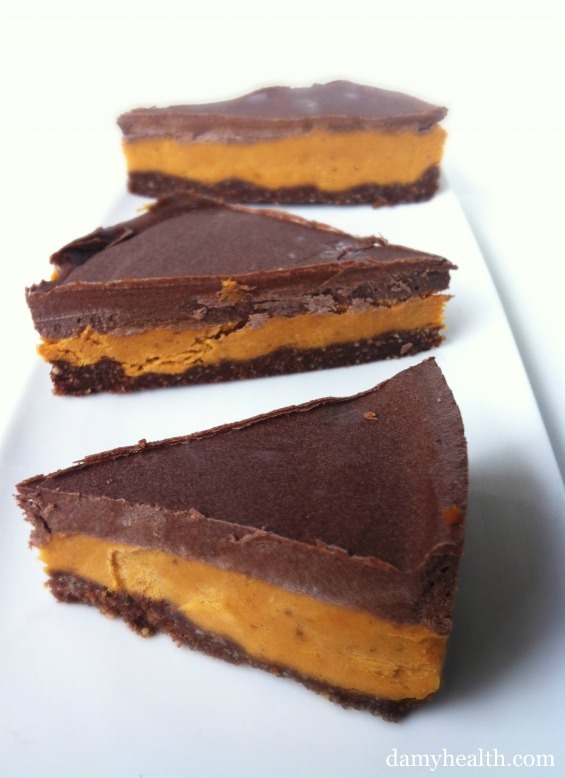 Serve this amazing dessert at your next event! 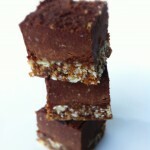 This recipe is no bake, vegan, coconut oil, gluten free, easy and peanut butter chocolate heaven! Separately blend each layer listed above in a food processor. 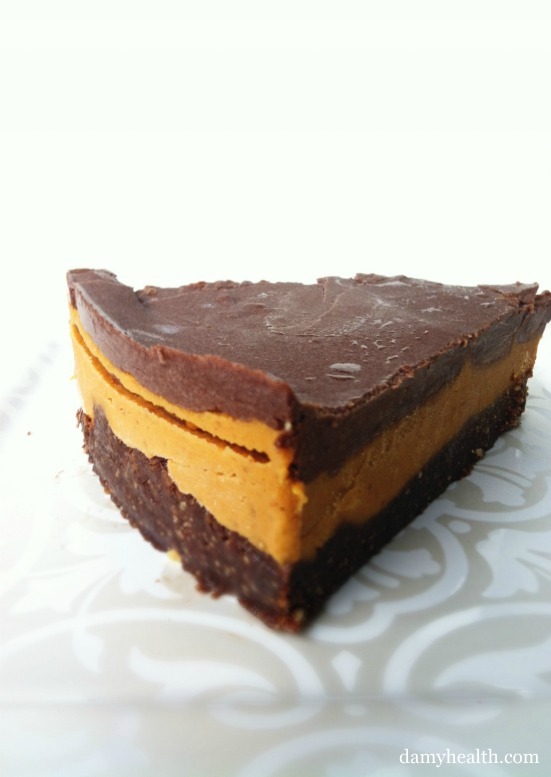 The crust should be dough-like, the peanut butter filling and ganache should be smooth. Grease an 8-inch spring form pie plate with a healthy oil. First press down the Chocolate Fudge Crust. 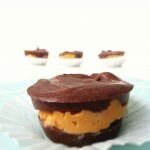 Then layer the Peanut Butter Filling. Finally, top with the Chocolate Ganache layer. Pick up and set down your pie plate a couple times to smooth out any bubbles. Chill for 3 hours in the freezer. Remove, cut into pieces and enjoy! DAMY Members – This is a treat option! Hey Kassie. It sounds like you melted the coconut oil before you mixed it? If so this would be the reason for the separation when freezing and liquid while using. What your coconut oil liquid or solid when you used it? To preface this, the recipe turned out very well! I was so worried that a mistake was going to ruin the flavor and it didn’t at all. The oil was in fact liquid when I used it. 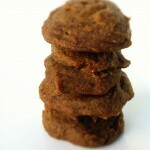 Thank you for your response, and if I may ask, what is the purpose of the dates in this recipe? Can I substitute anything for them, since I am not their biggest fan? Have a great day! I was wondering if I could use raw almonds or raw pecans instead of peanuts?? I really want to make this for Thanksgiving Day!!! I love all your recipes!!! Thanks so much for not only sharing….but for making healthy food taste so darn yummy!!!! 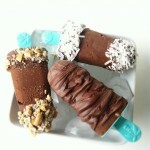 Great dessert recipe! It was loved by entire family including 2 year old and 3.5 year old. I did worry about my food processor when I was making it. The dates didn’t seem to agree with it. Was I supposed to soak the dates first? Also, have you eaten it chilled in the fridge instead of frozen? I might try that next time. Hey Beth Ann. That is great! if you food processor is older or having a hard time always soak your dates first. You can try it in the fridge! I am sure it would be great 🙂 Have a wonderful day! Can’t wait to make this! I don’t know if this is a silly question but when you say cocoa, are you referring to unsweetened cocoa powder? The dates made the blade of my food processor get stuck. In the process of unsticking the blade, I cut my finger to the point of having to call for help to get me to the hospital. Determined, I set out to finish the pie without my thumb this morning. Wow, it is absolutely impossible to spread the chocolate layer onto the top. The mixture is so thick that I came back to the computer to make sure I haven’t left out an additional liquid ingredient. I didn’t. I put the first two layers of the pie into the freezer and I am going to try to heat the topping to see it it will soften up. I am not really sure what else to try. Frustrating and disappointing. That is a wild adventure! Sorry to hear about your finger, who bizarre! The only reason I can think of that your chocolate layer wouldn’t spread is maybe your food processor is not high powered enough to get the chocolate smooth enough. I assure you that it is an amazing recipe that always works wonderfully here and for many others. Needless to say, that food processor found its way into the trash! I solved the mystery with my chocolate topping. Somehow, when I printed the recipe, the line that has the coconut oil didn’t print. Funny print margins? I just remade this recipe and used the coconut oil and it seems to be a success. I’ll have a hard time waiting three hours while it freezes to try it! Thanks for the feedback. I think I won the battle this time! 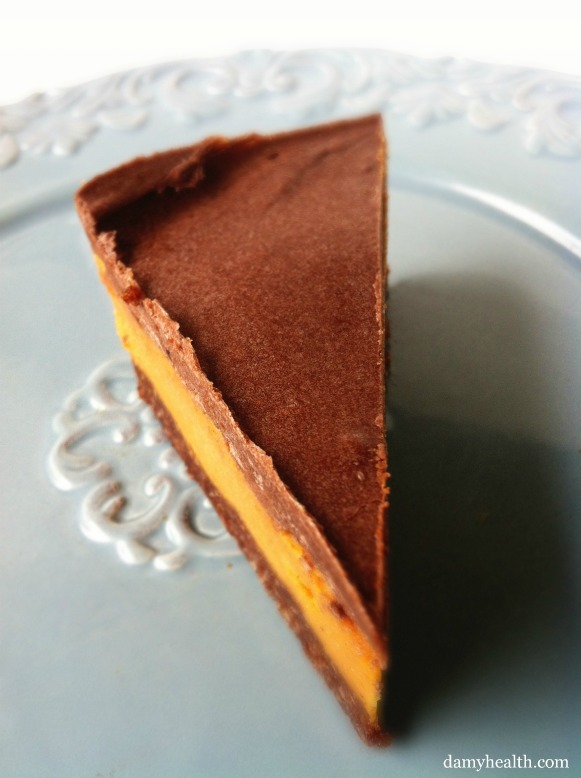 With this recipe is there anything that can replace the pumpkin? I have been vegan for 3 years and just now found out I am allergic to pumpkin. Anything I can do? Really want to make this. Yes! You can try cooke pureed sweet potatoes or squash! So if I want to fix this ahead a few days for a Thanksgiving dessert… how do you recommend storing it? I read one person’s issue with the coconut oil forming a white layer. Can you give specific feedback to avoid this happening? Thanks! Store This recipe is best stored in the freezer until a couple of hours before you are ready to enjoy it. The coconut oil will only turn white if it is heated. So do not heat the oil at anytime. Just scoop it into your processor at room temp. It will just heat enough to blend perfect from spinning. Enjoy!